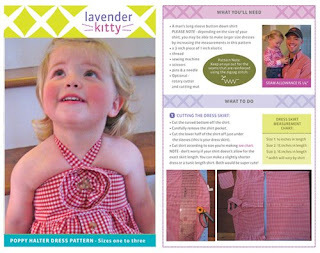 Introducing the latest pattern from Lavender Kitty - the Poppy Halter Dress!! I'm bursting with excitement, this has been a long time coming! So ever wonder what to do with all of those old or unworn men's shirts? 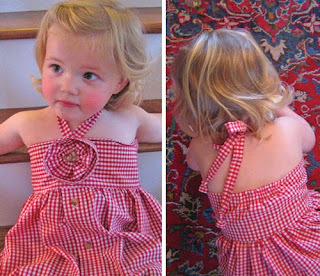 Well, here's a fun pattern to help you turn them into pretty dresses for the sweet little girl in your life. 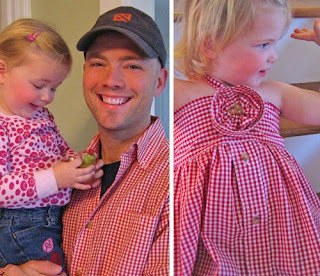 Not only will she look incredibly cute, but whoever donated the shirt (dad, grandpa, uncle, etc) will feel extra special. Make one to celebrate an occasion like Father's Day or to feel close to a far away loved one. They're also great for everyday - MG loves how easy & breezy they are. The possibilities are endless and you can feel great about recycling an unused item! A NOTE ABOUT MY PATTERNS: I write my patterns in a way that's very beginner friendly (lots of pics for reference). 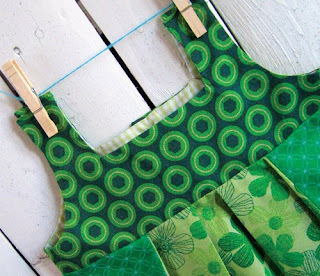 So if you're new to sewing they should be great for you. 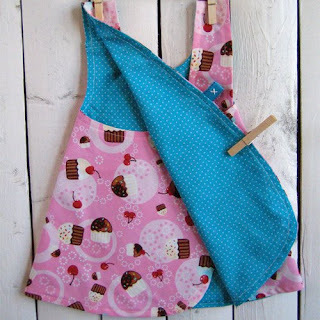 If you're a pro, you could sew up a ton in no time. 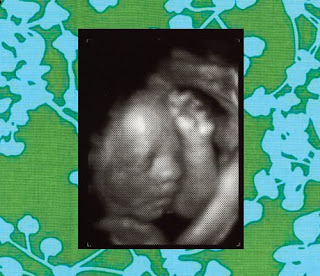 Okey doke, here's the deal - I had another ultrasound yesterday and I'm thinking baby 2 is a boy. No seriously, it looks just like Tim!! And the never-ending tae bo that this little one insists on practicing has me thinking it could be a super hero in training. Heaven help us! Now we all know my track record with guessing is not so great (completely wrong in truth), but you take a look... I'm not nuts right? Well, at least not with this one! Now enough baby chatter, get outside and enjoy this gorgeous weather!! Happy day to you all! 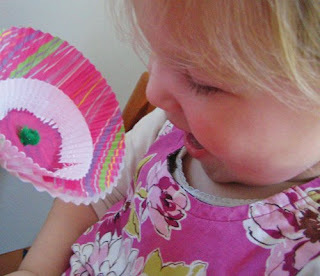 ... a really fun crafty kids project! MG has been "I-spying" all over the place lately, so I thought it would be fun to turn it into a free tutorial. And, since we're trying to save moola, I figured it would be an added bonus to make it a recycled art project by only use goodies from around the house. Who doesn't love that?! 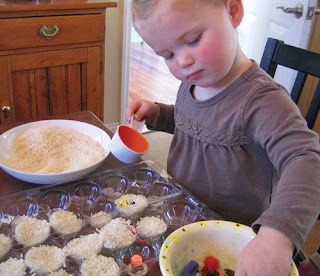 Place the rice and goodies into separate bowls. 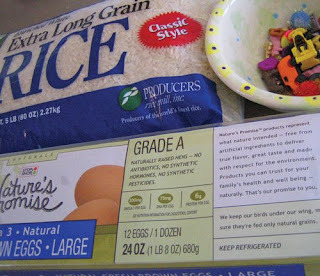 Then have your little one scoop the rice into one side of the carton. As they do this, let them add some goodies to each cup every now and then. 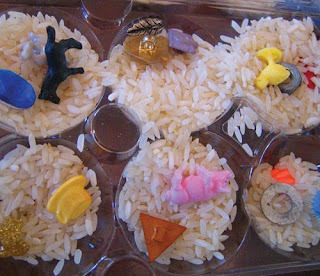 Once the rice is level with the 1/2 egg cup (see pic) and all the goodies are added, close the carton and secure in place with packing tape or a glue gun. Now you're ready to play! 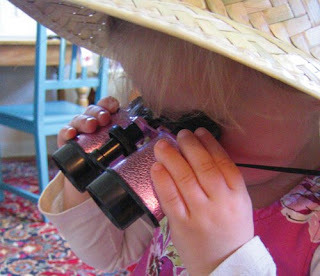 If your kids are still little like MG, have them try to spy what they can find. If they're older, keep a list of all the goodies and see if they can find them all (big folks can have fun doing this too). Both games are great because they encourage curiosity and you could theme yours by what you put in it. For example - "Princess" with sparkly things or "Handy Guy" with washers, nails, etc. Happy spying everyone! Wow, I can't believe we're back to Friday again, the weeks are flying by! So happy weekend to you, it's going to be a great one with lots of sun. 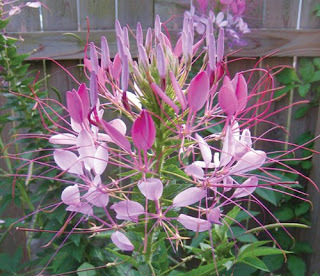 I can hear my garden calling already - especially the bazillion weeds that need pulling. Yikes! On to Font Fridays ... today features Wilton Foundry's newest font, Werk. It's already a "hot new font" on MyFonts.com and I'm sure it will become a designer favorite quickly. 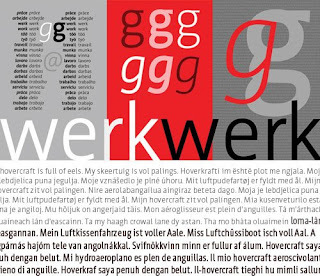 Here's why... Every trade has at least one piece of equipment that is an essential workhorse - for a gardener it may be a spade, for designers, it is a no-nonsense, versatile typeface family... hence the name "Werk" which is intentionally designed to be a "workhorse" typeface family. Hope all of you creative types out there enjoy it! Hooray for Earth Day! 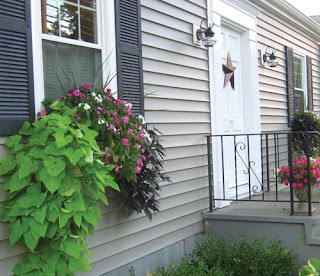 In honor of the occasion, I thought I'd plug MG's favorite place on the planet - Earthplace in Westport, CT. Their mission is to educate the community about nature and the environment. 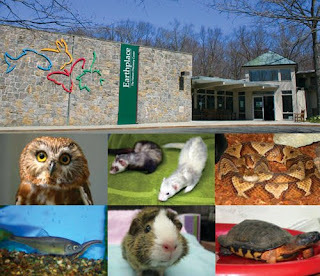 It includes a 62 acre wildlife sanctuary with trails, an interactive natural history museum, live wildlife for public viewing and many nature programs. 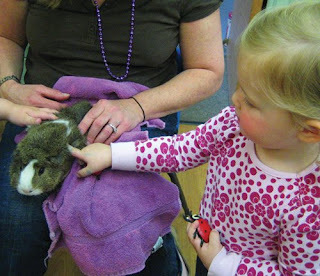 MG goes to the little preschool where they get to visit with the animal ambassadors every week - it's too cute! So, if you're looking for a quick field trip with the kids or would like to take a great hike in the butterfly meadow this summer, check out Earthplace. If anything, "Chatty" the bald eagle will make you happy! 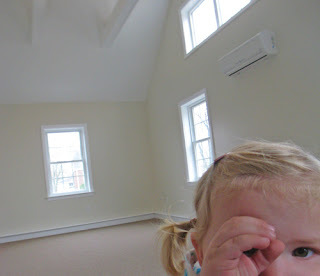 Happy news everyone - my dad and I are finally moving into our new studio!! Given that Robbie de Villiers Design (my dad's company) has been working out of a spare bedroom for many months, this is HUGE. 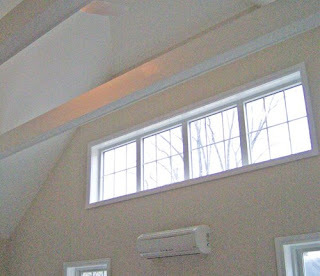 And thanks to Newton Remodelers, it's extra gorgeous with tons of windows and super high ceilings. 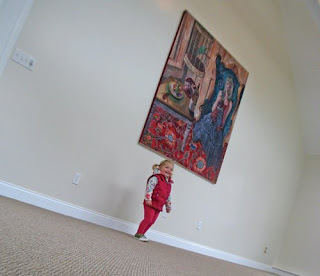 We even have the perfect wall to hang one of my brother PJ's amazing paintings. It makes the space. If you'd like to check out more of his fine art work you can look here or for commercial work visit his company, Shallow Tree. It's very cool stuff! Ooo, I can't wait to get our desks this weekend and to settle in. Hooray! Every now and then I fall in love. Don't worry, no need to warn Tim, I mean in love with a brilliant design or idea. Phew, I know you were worried! Well, I've been getting the online magazine "Small" for a while and it's insanely cool. So when the email fairy let me know that Small has a new blog my heart fluttered. 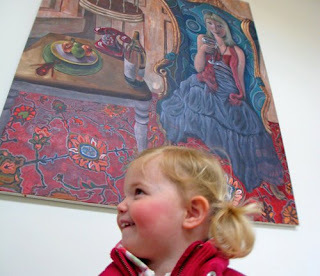 For any of you that love design, have kids or know some kids, it's worth checking out. Lots of pretty pictures and beautiful things to lust after. 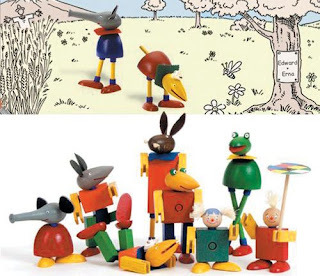 The latest features are the Kellner Steckfiguren plug-in figure from 2 Foot 9 and a great collection of rubber stamps from all over. Even the site sponsors are pretty to look at! Check it out - it'll make you want to be a kid all over again! I'm a huge fan of upcycling. AKA - taking something old or no longer useful and making it into something new. With that in mind, I figured it was time to do an upgrade with the zillion random bangles lying around my house. Yeah, most were from fashion fads long gone. Anyway, they turned out to be quite snazzy, so I thought it would be a fun free project to share with you all. 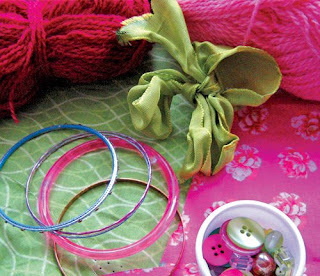 Dab a little glue on the bangle to secure one end of your yarn, ribbon or fabric to it. Then wrap around the whole bangle and glue the end in place. Careful with your fingers and the hot glue - I almost made my thumb a permanent accessory on the green bangle! 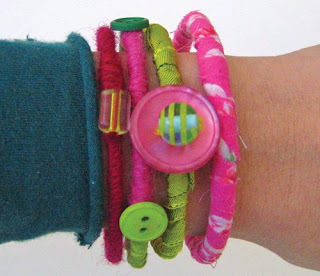 Once it's covered, add a doo-da of your choice (button, bead, sequins, etc). Ta-da, boutique style jewelry with no cost to you. Plus, they make great eco-friendly birthday and mother's day gifts! Make a few and you're sure to make someone happy too! 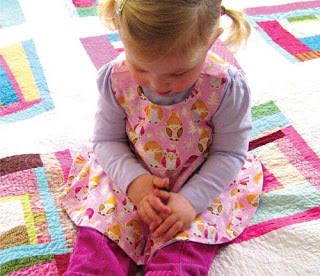 Just to mix it up a bit, here's a little mid-week Crafty Kids project. 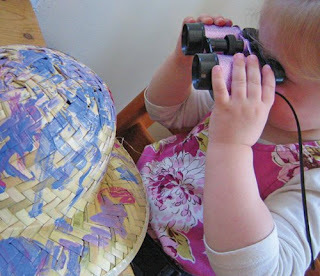 MG went to a great party last week and the favors included a "so-fari" hat & "oculas". When we got home she was determined to paint her hat and I thought, why not? Let's just say that afterwards she explored all day and went to bed wearing them. Yeah, no amount of convincing was going to change her mind! Since she had so much fun, thought your kids might too. It's a simple one folks ... break out the paint and brushes and let your little one go to town on the hat. They'll love designing their own exploring equipment and, if they're older, encourage them to deck it out. Maybe add a headlamp or compass. Once it's dry (a hair dryer will help it along), blaze a trail and go on safari. You never know what they could discover! 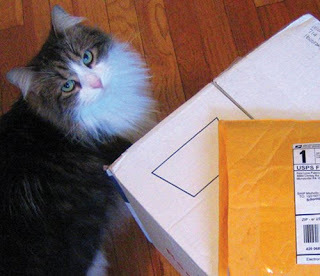 There's nothing like getting a package from the mailman, especially one that's unexpected! So you can imagine how excited I was to come home to 2 packages last night (and neither had anything to do with bills, phew). Are you as intrigued as I was to see what was inside? 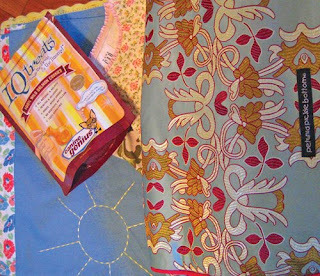 Well...the smaller mailer had an amazing set of MoMo fabric charm packs that I ordered last week. I know that's technically not unexpected, but my pregnancy brain completely forgot about when they would arrive. 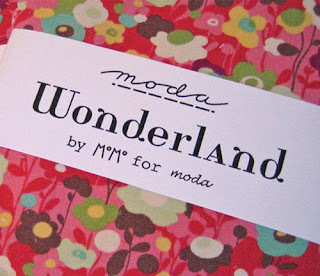 Each set included samples of the complete new line of Wonderland fabric and I'm in love! It's much brighter in real life. Seriously, my whole house is going to be designed around them (if the renovations ever end). The mega box was filled with amazing goodies from a favorite friend and client. 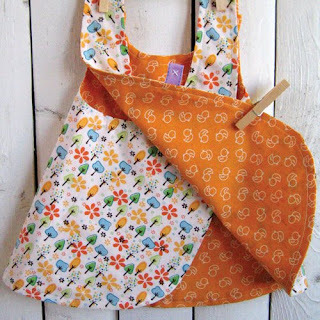 Including a much needed Petunia Pickle Bottom diaper bag that's a stunner. So let's just say, I'm feeling like one happy, thankful, lucky girl today. Hope you're having some happy moments too! Hope you had a happy Easter! We had a great weekend with friends and family - speaking of, WELCOME baby Brighton and happy baptism baby Ivy! 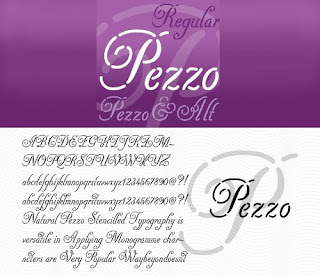 Today's font is Pezzo - mostly cause it's name reminds me of Easter candy, yum! So, the idea for Pezzo was born when my dad saw an old copper monogram stencil. The script forms are inspired by the titles and signature inscriptions on several Dutch seventeenth century paintings. These inscriptions are simpler variations of what was commonly used at that time - brushes were used rather than quills. By default, the brush strokes formed simple round endings. Combined with the unusual breaks in the copper stencils, he thought this treatment would create an interesting contemporary script. Pezzo is ideal for boutique logos, menus, invitations, announcements, certificates, brochures, headlines, and anywhere you need the elegance of script but with a contemporary boldness. I hope you'll enjoy using Pezzo as much as he had fun creating it! Those of you who know MG, know she's not a napper. Much to my constant dismay! So when you see this pic from today you'll appreciate this rare moment. Let's just say a crazy work week has proven to be the nappy naptime remedy. Just wish I could join her! Hope you're having a happy day on your end of the stick! Happy Wednesday everyone! Thought I'd share the latest pic of baby Newton the 2nd with you. 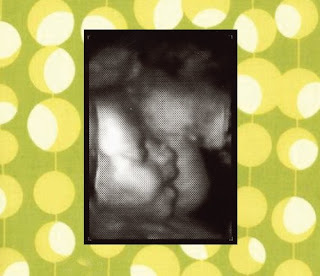 It's crazy to think that in about 8 weeks this little one will be here and I still have no idea if it's a boy or a girl ... seriously, your guess is as good as mine! So with the arrival seeming to speed up like a rocket ship (MG is really into them at the moment, so it's the first fast thing to come to mind), I decided to have a little look at the newest baby products. Whoa, there are so many cool new things! 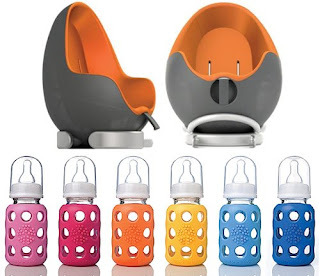 The Wee-go glass baby bottles are super fun & colorful. Plus they're safe for the environment and your baby. Bonus. Another very cool find was the Nestt car seat. It's only a prototype at the moment, but the egg-shaped design is ultra hip with a memory foam seat. Did I mention it swivels? Yeah, anyone that's wrestled a toddler into a car seat can appreciate that feature! Do you have any favs to share? I'd love to hear about them! Say a hearty hi to Olive and Finn - the first addition to the toy section in my etsy store! 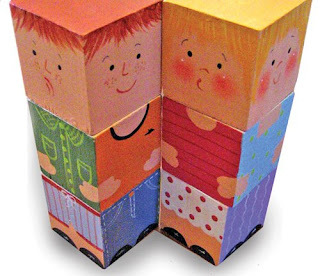 Help these block buddies decide what to wear and what kind of mood they're in today. 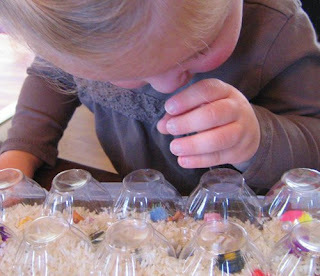 There are tons of possibilities making for endless play and lots of imagination encouragement. Made the old-fashioned way in our studio, with non-toxic paint and lots of love and happiness. 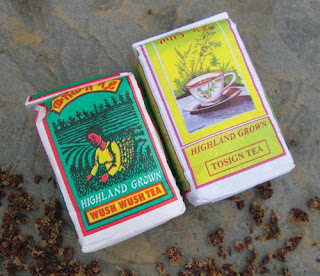 They're tested by kids young and old and made to be played with often (just wipe clean with a damp cloth). 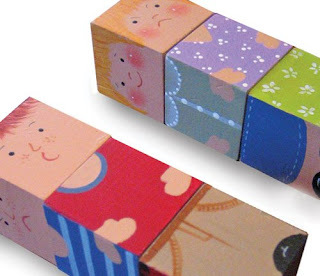 Each set includes three 1 1/2 inch square wooden blocks (one buddy). 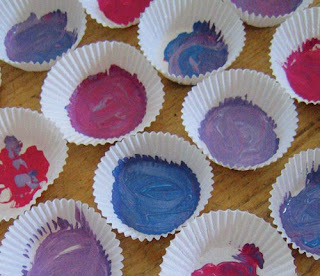 Collect a few for even more mixing and matching fun. 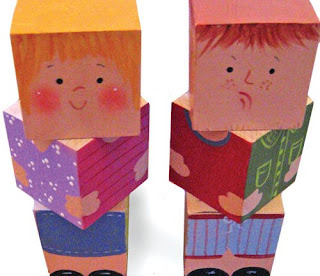 Keep an eye out ... more block buddies will be arriving soon! Please email me if you have a special request for a custom block buddy. Sorry that Crafty Kids is a day late, work has been super busy. How about we think of it as almost a week early instead ;) Anyway, this craft celebrates Spring and would make a great Easter gift for moms, grandparents and friends. 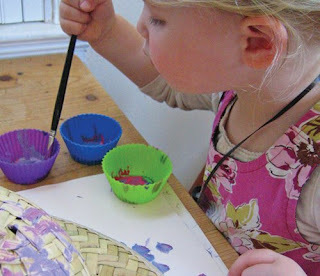 It's also fun for kids of all ages to create. Why not make a whole garden of them?! 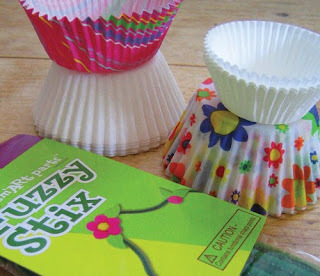 Have your little one paint the insides of the cupcake cups. 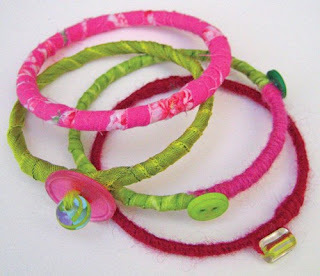 After they're dry, snip a little hole in the middle of all your cups and thread the pipe cleaner through. Get creative stacking different combinations, there are no rules. 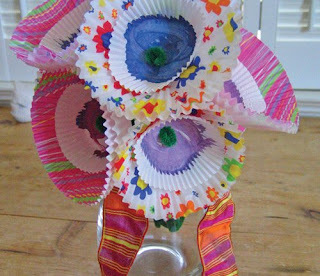 To secure your flower, make a small bend in the pipe cleaner under the flower and in the inside as well. Create a bunch and give them freely! Font Fridays are back! Since my dad's out of town and I have the office to myself, I've chosen one of my favorites - Miss Pink. Can you tell that I had something to do with the naming? Really, what gave it away - the pinkness or the missy-ness? Kind of reminds me of a delicious cupcake, yum. 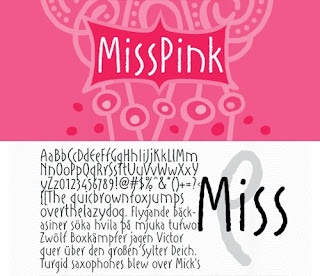 Anyway, Wilton Foundry debuted Miss Pink in 2005 and it's been fun, flirty, and girly ever since. 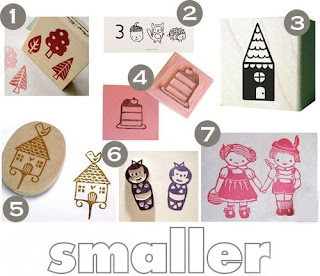 It's the perfect accessory on invites, announcements, scrapbooking pages and boutique signage. Kind of like the ultimate pair of shoes that you've always hoped for! Every year right around now I start to go a little nutty. No seriously, the Winter is over and Spring has sprung, but not quite enough for my liking. 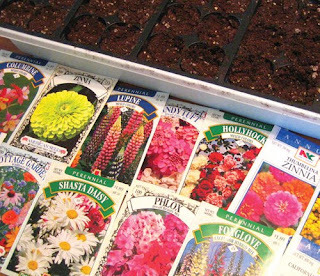 So this year I've decided to start some seeds indoors (usually I buy flats of flowers at the nursery for instant gratification). You'll notice I went a little overboard at the seed rack cause they all tried to woo me! 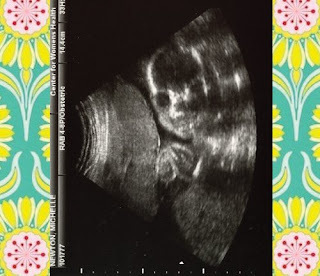 Now I'm not making any grand promises of success, especially with a baby 9 or 10 weeks away, but I am thoroughly excited to see how it goes...or grows (that's a pregnancy brain joke, yikes). Anyway, it's a fun little project for MG to keep tabs on and hopefully we'll end up with something to add to our cottage garden. 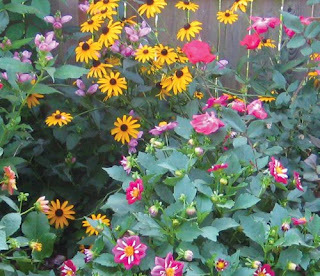 Last year it was super colorful (see pics), so I'm hoping this year it'll bring just as much oomph and happiness to the neighborhood. What bits of happiness can you grow for the folks around you?